Today is the day the Church remembers Nicholas, who grew up to be a Bishop in a small town, long ago, and far away. His life was so exemplary that he is remembered today not only by the Church but by the secular, commercial world as Santa Claus. Yes, there really was a Santa Claus,his name is Nicholas, and he was the Bishop of Myra as the world turned from persecution and death to open faith in Christ. Saint Nicholas was born in 260 AD into a wealthy family living in Patera, a coastal town in what is now Turkey. He became Bishop of Myra in the fourth century, and there are many stories of his love for God and for his neighbor. Through his priesthood in the early Christian faith, he came to be recognized for his generosity to all those in trouble. In his good-doing role as priest, one story tells of Nicholas, who took pity on a girl in his parish whose family had no dowry. Had Nicholas not intervened, this would have prevented her from marrying. He made a parcel of money from his family's coffers and donated it anonymously to the young woman and her future by throwing it in through the open window (or, when the story came to be told in colder climates, down the chimney), where it is said to have landed in her stocking. This is why we put gifts and especially "gold" coins in stockings. That is why I put "gold" chocolate coins in my kids stockings, to remember. Bishop Nicholas did this type of anonymous giving more than once, and he became known for late night gifts, and the granting of wishes. That is why, if we give a gift to someone today without saying whom it is from, it can be called "a present from Saint Nicholas (or Santa Claus)", because while we may or may not know the recipient, God does and loves them! He was also fearless in defending the innocent. Once when some men were falsely accused and about to be put to death by a corrupt Roman Judge, he stepped in and grabbed the sword of the executioner! That is a strong man of God, not some silly, jolly elf! During the reign of the Roman emperor Diocletian, Bishop Nicholas was imprisoned and tortured for his beliefs but he never forsook his faith. The new Emperor Constantine eventually released him. Tradition has it that Bishop Nicholas attended the Council of Nicaea in 325 with many other bishops, a meeting that produced what we today call "The Nicene Creed". The beloved bishop died in 343AD and his body buried in the cathedral at Myra. The name St Nicholas lives in the hearts of people all over the world, young and old alike. He may be known as Santa Claus and Father Christmas today, but he was a real man, whose faith and actions point us to the Christ born in this world for all of us. † Almighty God, Who in Your love gave to Your servant Nicholas of Myra a perpetual name for deeds of kindness on land and sea: Grant, we pray, that Your Church may never cease to work for the happiness of children, the safety of sailors, the relief of the poor, and the help of those tossed by tempests of doubt or grief; through Jesus Christ our Lord, Who lives and reigns with You and the Holy Spirit, one God, for ever and ever. Amen. 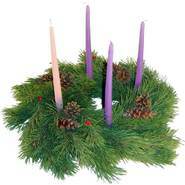 Advent begins today. It is a time that most of our culture has completely forgotten in their headlong rush to consume and commercialize the premature celebration of Christmas. There are many Churches looking back to the practice of the ancient Church, where the year for the Church begins today, the Sunday four weeks before Christmas. I think that many people hunger for the rhythm that following Christ through the seasons of His life brings us. I like that the season of Advent starts out by looking back, to a time before the birth of Christ, to show us how the people of God learned hope in ancient times. Then the season of Advent looks forward, far beyond the birth of Christ, to the true Object of our faith, the King Who comes to conquer the darkness, restore creation, and establish His Kingdom for ever. The Prophets of ancient Israel talked about a world very much like our own, a world of people rebelling against God and finding themselves lost in darkness again and again. However, the prophets also show how God has a plan, not only for Israel but also for the whole world--a plan that extends beyond the birth of Jesus Christ in Bethlehem. Go and listen to the hymn O Come, O Come Emmanuel, and remember that the coming of the baby Jesus did not complete God’s plan. The Incarnation is the Sign, which assures us that there is reason to hope. And so, in Advent we recall the ancient prophecies and signs which led to the birth of the Messiah, and we look forward in hope, applying those same ancient texts to our lives and the world we find ourselves in. Jesus Christ will come again just as He promised, not only in clouds of Glory but in each of our lives. O come, O come, Emmanuel! Almighty God, give us grace to cast away the works of darkness, and put on the armor of light, now in the time of this mortal life in which Your Son Jesus Christ came to visit us in great humility; that in the last day, when He shall come again in His glorious majesty to judge both the living and the dead, we may rise to the life immortal; through Him Who lives and reigns with You and the Holy Spirit, one God, now and for ever. Amen. This is a life changing event, not easy but very rewarding. Consider becoming a part of it. The Ignatian Retreat in Daily Life is a prayer journey for those who want to live more deeply in relationship with God. Based on the Spiritual Exercises of St. Ignatius of Loyola, the retreat is a time set apart in the midst of everyday life to help participants discern more clearly God's movement in their hearts. Twice monthly individual spiritual direction. Fees for the retreat are $10 per weekly meeting and $20 per session for spiritual direction - or $80 per month. There is a one-time fee of $50 for materials but no one is turned away from the retreat for lack of funds, and a fee schedule can be agreed upon based on ability to pay. If you are interested in the Retreat in Daily Life, contact Katie Boudreau, kboudreau7@cox.net (Tulsa area) or in Oklahoma City, Marilyn Seiler at mjsjuly@yahoo.com. They recruit during the months of July and August for their October session. Give rights to slaves, widows, poor, & foreigners?! About 3000 years ago, someone, apparently in the Royal Court copied some laws down on a broken piece of pottery. This was the post-it note of the day. Archaeologists believe that the Royal official (scribe) was copying down laws in an educational exercise, learning the laws. The pottery shard was found in 2008 about 15 miles south west of Jerusalem. It is the oldest piece of Hebrew we currently have, a thousand years before Jesus. The question I had was, what does it say? What was the people God was calling to Himself thinking about as laws fro their culture? Will Christians today hear God's calling to us? Well, there it is. The oldest witness of the Hebrew people, that God called to Himself. Doesn't sound much like regular old human nature to me. Foreigners? You mean those ILLEGAL ALIENS FROM MEXICO? Give them RIGHTS? What sort of Liberal claptrap is this? Poor have RIGHTS? Even the poorest workers? Occupy a Widow's house to keep a bank from evicting her?! How can America survive if we follow this sort of Liberal Garbage? Oh... God calls us to this. It isn't Liberal or Conservative, it is God's way. God has for centuries called His people to reach out to the downcast, the dispossessed, and the ones not at the top of society. Not the 1%. He is Lord of all humanity, and how we treat His people is important. It matters. There is a man at the gate, his name is Lazarus. Bishop Doyle of Texas has this comment "I am convinced that how we live our lives today affects how we live in the kingdom of God today and how we will live in the kingdom of God in the future. In fact, it may be impossible for us to arrive at God's gate if we are not holding the hands of Lazarus, himself. The blessing of the Cross and the Resurrection is not some kind of free ticket out of jail at the end of our lives, is freedom given to us in order to serve those in need and those in our midst." Last night, I spent an enjoyable evening with some Episcopalians in a local Theology Pub. We had pizza and sodas and beer, but the really interesting part was that we shared that meal with members of Occupy Tulsa. The conversation as you might imagine was animated, with many agreements and some more divergent viewpoints, but one thing that intrigued me, was the commitment to Orthopraxy that the OT seemed to have. One of the members quoted Rabbi Abraham Joshua Heschel,who joined Rev. Martin Luther King, Jr in his protest marches. Rabbi Heschel said “I felt my legs were praying” when he was walking with Dr. King. There is definitely a connection with action and prayer and faith. Something that our clean suburban communities have kept off our tidy lawns. It reminded me of a friend, who is a Baptist Missionary that goes to Myanmar (Burma). He spoke of the freedom of the Church, how they had no interest or ability to affect politics, and simply worked for the Gospel. I suppose somewhere in many ways we Christians have forgotten that it is Jesus that is Lord, not Caesar. May all our legs...pray. I am c urrently reading "The cost of community" by Jamie Arpin-Ricci. He is the leader of a Franciscan community in Winnipeg. In the first chapters he describs how St. Francis, while praying in the Church of San Damiano h eard the words of Christ - "Francis, go repair my house which, as you see, is falling completely to ruin." Francis heard the wor ds clearly, and began to obey them, rebuilding that small, dilapidated chapel - it was sometime later when he realised the real meaning of the words, to rebuild the Body of Christ. I am mulling this concept over... how could St. Francis have missed what God meant? The very day I started pondering this, I recieved a card from two Brothers in my community, who are on a Franciscan piligramage in Italy. They are praying for us at different sites. What a great blessing! So, how can I hope to both hear and know what God is saying to me? How can you? O God, from Whom all good proceeds: Grant that by Your inspiration we may think those things that are right, and by Your merciful guiding may do them; through Jesus Christ our Lord, Who lives and reigns with You and the Holy Spirit, one God, for ever and ever. Amen. It has been ages since I posted, thought I might take it up again. Yesterday my friend, Ben asked on his Facebook page "are you Greedy"? That really got me to thinking - just how greedy am I and how do I face it in my own life? Can I even see it? Then just before 10 pm, I got a phone call, and though I was already in bed and really tired, I answered the unknown number. Turns out, it was from a friend who is in prison here in Oklahoma, and will be for a few more years. All though the call, I kept thinking, how tired I was, and how I wanted to get him off the phone. Finally, about 20 after ten, he had to go, and I dropped back into sleep. Then this morning, I looked at this Icon by Fr. Robert Lentz, OFM. It sits on my dresser among others. The question this Icon poses, is Christ looking out of His prison, or looking in at mine? Our God has Ascended! Ascendit Deus! Here we are, some 6 weeks, but more especially 40 days after Easter. Our Lord has walked among us all this time, but today what can only be referred to as unexpected happens. 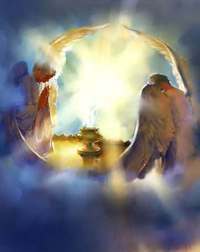 As the ancient Creed tells us, He ascends into heaven to sit on the right hand of God the Father. Can you imagine the shock among the gathered disciples? Remember no one was used to planes, hot air balloons or any human defying gravity. Are these only dry words written on fading parchments or do they have meaning in our lives today? The texts tell us that it was this day that Jesus ended His earthly ministry and left this world. For me, the Ascension is a Glorious Mystery. I know perfectly well that Jesus did not go into orbit around the planet, shoot into interstellar space or go behind some cloud to peek around the corner. I understand He Ascended into Heaven, wherever and whatever that may be, I do know that from there He continues His ministry of reconciling the world to His Father. I know that He will come again someday, but far more importantly I know that from the Throne in glory He enables me to begin bringing the Kingdom into this world, every day. Almighty God, Whose blessed Son our Savior Jesus Christ ascended far above all heavens that He might fill all things: Mercifully give us faith to perceive that, according to His promise, He abides with His Church on earth, even to the end of the ages; through Jesus Christ our Lord, Who lives and reigns with You and the Holy Spirit, one God, in glory everlasting. Amen. For those of you who want a different way to remember St. Anselm...behold! Almighty God, Who raised up Your servant Anselm to teach the Church of his day to understand its faith in Your eternal Being, perfect justice, and saving mercy: Provide Your Church in every age with devout and learned scholars and teachers, that we may be able to give a reason for the hope that is in us; through Jesus Christ our Lord, Who lives and reigns with You and the Holy Spirit, one God, for ever and ever. Easter Blessings! Christ our Lord is risen! So often we hear these words, but do we see the sights? Easter is a visual event, we often forget. How did people seeing the miracle of the Resurrection for the first time react? Never forget, they were the least powerful of their community, they were women. Women steeped in Jewish culture and meaning, they KNEW the emblems of their faith. What did they see when they arrived at the tomb? As what I would consider THE pivotal event of Christianity, I would think it would be pretty clear in it's description in the Gospels, however it just isn't well defined. I suggest we begin by not taking the texts of the Gospels for granted, not assuming that we know what they say. The interesting indeterminate nature of these passages might then become less of a problem than a theological stimulus to find the meaning of the empty space we see in the tomb. Archbishop Rowan Williams has written an essay called "Between the Cherubim: The Empty Tomb and the Empty Throne," and has suggested that imagery of the Ark of the Covenant might help us modern Christians understand early Jewish thought when confronted with the emptiness of Jesus' Tomb. Hidden in the Holy of Holies or carried before advancing armies into battle, the Ark, in Hebrew Scriptures, marked the presence of God with an empty space — the space between the cherubim. This is unique in the ancient world. The Ark was considered to be the throne, or the footstool containing of the tablets of the law, of an always invisible God. This God was the only God Who must not be represented, Who cannot be possessed or contained, Who is where there appears to be nothing. In other words, the most sacred space where God was in the midst of the Hebrew people was empty. If you went to Jerusalem to visit God, what you came to visit wasn’t a golden idol, it was empty space--the holy absence and holy silence of the empty space between the cherubim. Because there was no gilded statue the Israelites were able to connect with the living presence of God in their lives. 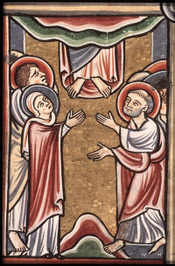 So, bringing us back to the Tomb of Christ, there, as told by Luke and John, when the Jewish women looked in, there are two angels, and John further states in 20:12 "and she saw two angels in white, sitting where the body of Jesus had been lying, one at the head and the other at the feet". So, they, who are used to the "God who dwells between the cherubim" suddenly see and know.. they KNOW Who Jesus really is, they see the imagery of the Ark, they know the empty space between the Angels in the Tomb is the evidence of the divinity of Jesus Christ -- the emptiness marking the presence of God in a way our modern minds forget. Jesus is Risen, He is Lord and Christ! Harold Stassen on Give rights to slaves, widows, poor, & foreigners?! Br. James Patrick on Give rights to slaves, widows, poor, & foreigners?! Deb on Give rights to slaves, widows, poor, & foreigners?! Adam Gonnerman on Give rights to slaves, widows, poor, & foreigners? !